One Prime Minister of India was once a visit to Afghanistan History records that many centuries ago there was Hindu civilization in Afghanistan. While there, the Prime Minister like to see the ancient relics of the country. While he was visiting these relics, the ambassador of India at Afghanistan pointed out an ancient monument and said, “Sir, this is a symbol of Hindu culture”. The Prime Minister Kept silent. When, near another moment, he said likewise, the Prime Minister lost his temper and bluntly replied. “I do not understand any such thing as Hindu or Muslim culture. I understand only one culture and that is human culture”. 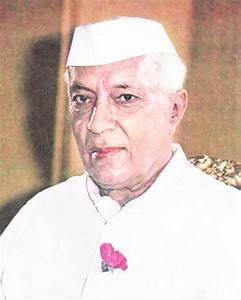 The Prime Minister who said such an universal mentality and a broad outlook, was out first Prime Minister, Jawaharlal Nehru. Nehru was born with a silver spoon in his mouth. He was the only son of Pandit Motilal Nehru, original a kashmiri Brahmin, but who settled down at Allahabad as an advocate. Fortune favored Motilal. In these days he earned annually in lakhs. So naturally he lead a very luxurious and glamorous life. He was westernized and hence tried to bring up his only son in that manner. At the age of eleven, Jawaharlal was get admitted at Harrow’s institute at Cambridge. He graduated from Cambridge and also became a Barrister after completing the course at Lincon’s Inn of London. The merit of Nehru and the chance of his being educated in England, made him one of the five Indians who are said to write English better than any Englishman. The other four are Mahatma Gandhiji, Rabindranath Tagore, Sri Aurobindo and Dr. Radhakrishnan. The English books compiled by Nehru, specially, letters from a father to his daughter. An autobiography and brief history of the World, have been highly praised in England and America and have been sold in lakhs. Nehru was born on 14th November, 1889. After being a Barrister he returned to India and started his profession in the Allahabad High Court. He could have earned a lot, due to the fame of his father. But he was not Interested in this profession. His father Pandit Motilal had a clerk named Mubarak Ali. He was an eye witness of the tyranny and treachery of the English men during the Sepoy revolt of 1857. He narrated all he saw and knew to Jawaharlal. This inspired a spirit of patriotism in him. He wanted to make his mother-land independent, left his profession and joined the Indian National Congress in 1913. After the demise of Tilak, the then leader of the Congress and the appearance of Gandiji on the stage, a revolutionary change took place in the Nehru family. Motilal was so much influenced by Gandhiji that he gave up his luxurious life and donated most of his property for the Congress. Like a befitting son Jawaharlal also followed the footsteps of his father. He was the first to join Gandhiji’s non-co-operation movement and courted imprisonment. Since then he had been behind the bars many times, but this has never diminished his patriotic urge. Rather, like adding fuel to the fire, each imprisonment made him more determined to earn the independence of India under the leadership of Gandhi, his incessant struggle and endless suffering gained the much cherished goal on August 15, 1947. Apart from patriotism, Nehru had and internally broad outlook. He hated that any nation should subdue another nation. He was a born democrat and hated autocracy. So he sharply criticized the activities of the Nazis in Germany, the Fascists Italy and the army of General Franco in Spain. When after the Second World War, the world was divided into two camps under the influence of two great but mutually anemically countries, Russia and America, Nehru felt it as a danger signal for a third war. So, he along with President Tito of Yugoslavia and President Nasser of Egypt formed a non-aligned camp. Gradually many countries joined this camp and it is undeniable that this saved the world from the destructive effects of a Third World War. Nehru was above communal-ism. So, he moved India a secular State. He was very fond of children. So, his birth day that is 14th November, is observed as “Children’s Day” all over India. On this day, children are given sweets and meritorious children are awarded prizes. 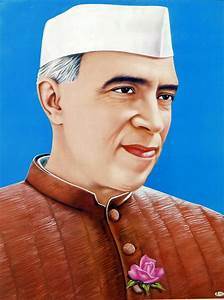 Since the achievement of Independence in 1947, Nehru continued as its Prime Minister till May, 1964 when he had to leave this earth for his heavenly abode.